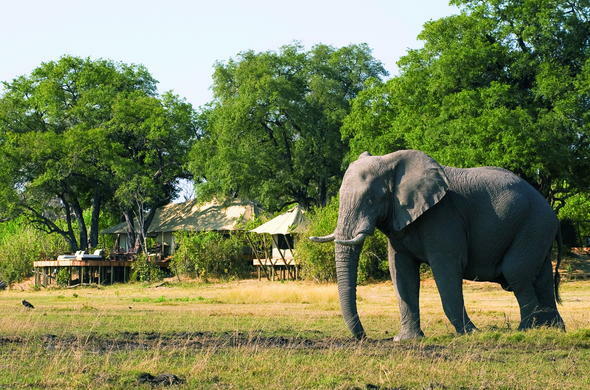 This Botswana safari camp is situated at the edge of a lagoon that is the source of the Savute Channel, where exceptional game viewing opportunities rival that of Chobe. Zarafa Camp is intimate and exclusive. Only 8 guests at a time can experience the wonders of Zarafa Camp. Personalised attention and elegant furnishings evoke a colonial ambiance. Activities on your Botswana safari are flexible and geared to your particular interests but game viewing is exceptional whatever you do, as the Selinda Spillway acts like a magnet for wildlife. This area is home to an abundance of game across the spectrum. Huge herds of Elephant and many predators live side by side in this wilderness. Accompanying great numbers of plains game such as Buffalo, Zebra and Lechwe are the Big Cats and also Wild Dog. Birdlife is prolific with more than 300 species already noted. When not out on activity, you can enjoy the comforts of this intimate camp. A plunge pool beckons in the heat of the day or you could have a soothing massage followed by a delicious siesta. Your sumptuous suite is a welcome retreat with its custom copper bath for lengthy soaks while appreciating the spectacular lagoon views. Children over 12 are welcome at this Botswana safari camp. Children younger than 12 can be accommodated with special arrangements. July offers a 50% discount for children younger than 16 years old. Due to Botswana being a malaria zone, please consult your doctor for prophylactics before coming to Botswana. There is a wealth of animals to see: Elephant, Lion, Cheetah and if you are lucky, a Leopard! The area is characterised by extensive floodplain savannah with the palm studded island breaking the skyline.